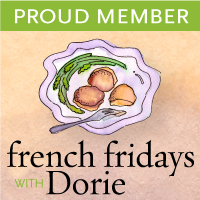 My first French Fridays with Dorie and my bread is coming out of the oven as we speak. I am embarking on an adventure with an online cooking group which will consist of selecting and trying recipes from Dorie Greenspan’s book, Around My French Table. Challenging myself to cook through Dorie’s book is a fun way for me to embrace my love of everyday French cooking by using her personal recipe file as my guide. The actual recipe is not supposed to be posted on the blog, only photos and comments about it. The only requirement to join this group is to purchase the book and try to participate as much as possible. I was inspired to join this cooking group by several people I enjoy following, Tasty Trix, scrambled hen fruit and the Cake Duchess. They’ve already joined the group and have been posting some very appealing dishes on French Fridays. Dorie, my new BFF, recommends a Pyrex bread pan for this recipe and I think that was a good call from the looks of the golden brown crusty exterior of my bread. I’m going to serve this cake salé with crème fraiche, smoked trout and an arugula salad. If there is a way to make a meal out of a fragrant cheesy herbal bread, I will find it. I used Comté cheese and a pinch of crushed aleppo chili in place of cayenne. I used half a cup of chopped chives as called for in the recipe but next time I will add a full cup as I felt the bread could have used more. I would also like to try a combination of different herbs, like dill, chervil or marjoram. I used the full teaspoon of salt with my choice of Comté for the cheese and was satisfied with the amount of salt in the bread. My favorite things about this savory cheese bread were the little bites of toasted walnuts, the flavor or the cheese and how the texture had just the right amount of crumble. I think it’s time to chill the wine as Dorie recommends. A slice of this cake salé with crème fraiche and smoked trout makes a good tartine or open faced sandwich to serve with a small salad composed of arugula, olive oil, sherry vinegar, salt and pepper. Ok now I have to remake this and serve with the smoked trout. Your pictures are beautiful! OMG! Yup, that's exactly what I said when I opened this page and saw that beautiful, perfectly baked loaf of deliciousness staring at me. I swear, I might have to cheat on chocolate, he will not be happy ;-). Then when I saw what you paired this with, my heart skipped a beat. Smoked trout and creme fraiche on this beautiful cheese and chive bread is a match made in heaven. Have fun with this cookbook, Patty. Can't wait to see what you make next. Enjoy the weekend! this looks gorgeous!! thank you for sharing this and have a great weekend. The presentation is beautiful – well done! What a great loaf and even better tartine. Welcome to FFwD, Patty! What an amazing idea! Your bread looks terrific. Oh, and welcome!!! What a terrific chive and cheese bread! Makes me seriously hungry now! What a great picture with the salmon! Absolutely gorgeous photos! Your lunch looks delicious. Ummm, WOW! I can't wait to try mine with smoked fish now too! Welcome to FFWD–your photos are fabulous! Welcome aboard! Very lovely. The open faced salmon sandwich was a beautiful idea. Spectacular !! Never considered the salmon topper- what a lovely addition to this savory dish. Keeps it perfectly flexible again for use as a meal or a “nibbler”. Great post. Gorgeous bread and it sounds so good with smoked trout and creme fraiche, yum! I am so flattered that I played a part in inspiring you! *blush* Well, you're off to a gorgeous start, that's for sure. I absolutely love how you served it, that must have all gone together so beautifully. Well Patty, it certainly looks like your idea to follow along has paid off…the bread looks scrumptious. Wow, sure glad you decided to participate in French Friday's with Dorie! Excellent choice of cheese. Love everything about this gorgeous savory bread, especially as you served it with smoked trout, creme fraiche and wine! I want that slice of bread with the salmon! In France we call it “cake salé” savory cake, and they're really my favorite little things to snack on or served as appetizer. Simply gorgeous! Oh I wish you were cheating and posted the recipe cuz this would be very tasty right about now at 8:30 am Sat morning! Looks DIVINE Patty! The online cooking group is a clever marketing tool for Dorie, isn't it? You have to buy the book and then blog about it. 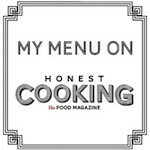 Not trying to sound cynical about it….as long as you are having fun and the recipes look great! Love the combination of cheese with chives and smoked trout with creme fraiche! The last photo is an absolute stunner!